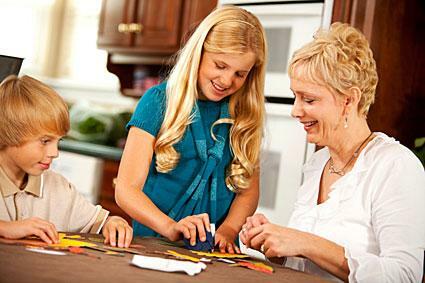 Give children the opportunity to share in the joy of Thanksgiving preparations by making their own decorations. Here are some ideas for simple craft projects that you and your children can make together. Toddlers may not have very many artistic skills at their age, but most are able to scribble on paper with a crayon. Set the toddler up in a highchair so that he will be safe and able to focus. Provide him with some chunky, non-toxic crayons and a sheet of white or colored paper. Let him scribble to his heart's content. When he's finished, cut the paper into strips and use for the dinner napkin rings. Tape or glue the ends of each strip together to form napkin rings. This project is often made in preschool art classes around Thanksgiving time. Trace your child's hand on a sheet of nice paper. Let your child color the hand. 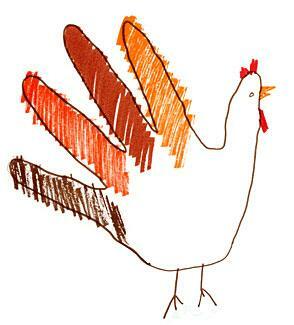 Turn the thumb into the turkey's face by adding eyes, a beak and a wattle. Help your child embellish the tail by gluing craft store feathers to the other fingers. Date the back of the turkey and save it. As your child grows, it's fun to remember how tiny his hand used to be. Make your toddler proud by helping her create a display of her artwork. Let her help you put this craft together as much as she is able. Give your child a Thanksgiving themed coloring book and let her color in some of the pages. Carefully cut out the items from the pages. Help her glue them to a large sheet of brown craft paper. Frame the collage with yellow or orange construction paper or seasonal craft paper that has designs printed on it. Hang the collage on the family room wall or on your refrigerator. Here are several crafts with a turkey theme. Your children will have a lot fo fun making these turkey centepieces. Ball-up newspaper or magazine pages to make the head. Stuff the newspaper into the bottom of a medium-sized brown bag. Form a neck by twisting the top of the bag. Glue the eyes onto the bag, and then tape the red balloon on the face to form a wattle. To create the turkey's body, use one paper grocery bag. Cut a hole through the front of the bag an inch from the bottom and fit the neck into it. Stuff the body two-thirds full with newspaper. Close the top of the bag with the rubber band. For the tail feathers, cut five large half-circles from the construction paper. Glue them in layers to the back of the body. One of these turkeys could make a fun decoration for your table. 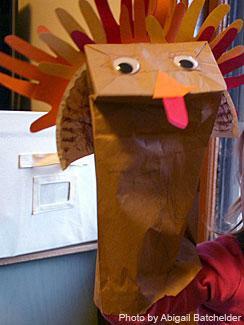 Here's another easy Thanksgiving art project suitable for slightly older children. Your child can make one for each guest. Paint the two blocks of wood burnt orange and let them dry. 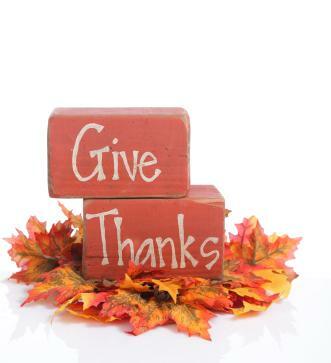 Use a pencil to letter the first block with the word "Give" and the second block with the word "Thanks." Using a small brush, paint over the pencil lines with the white paint. When the paint is dried, stack the blocks on top of the flower ring. The arrangement can be glued to a base or simply set on a plate to make a great Thanksgiving or fall decoration. 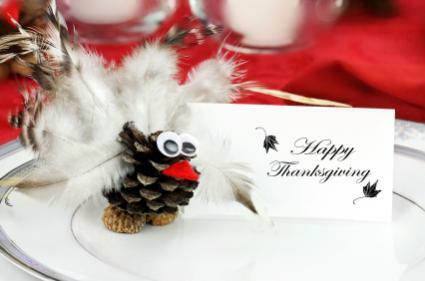 These cute place card holders will come in handy at your Thanksgiving feast. Glue dots on the 'back end' of your pine cone. You'll want to cover the whole back end with feathers to resemble a turkey. Attach the feathers accordingly. Glue two dots on the 'front' of your turkey for eyes and attach your googly eyes. Glue a spot underneath the eyes for the wattle and attach your red fabric scrap. Let the turkey dry overnight and voila - you have super cute turkeys for your Thanksgiving table. This is one time your child is encouraged to play with food! Trace the thumb of one hand onto brown construction paper twice. Cut out the two shapes and glue them together with the top half of a toothpick in between. Use the marker to make dots for the turkey eyes. Poke the exposed end of the toothpick into the apple to make the neck and head of the turkey. Take three gum drops and stack them on the toothpick leaving enough of the toothpick exposed to poke into the apple for the turkey feathers. 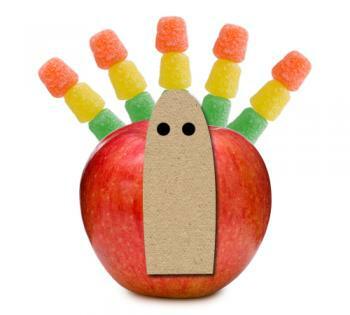 Make a total of five stacks of colored gumdrops, and poke them in a half circle around the apple. This forms the tail of the turkey. Use mini-marshmallows in place of the gumdrop candies if desired. A group of three apple turkeys would make a nice table decoration for a family Thanksgiving dinner. Children grow up before you know it. Cherish the time you spend together on these arts and crafts projects as much the actual decorations. They'll become sweet memories in the years to come.